To celebrate St. Patrick’s Day, I wanted to make a recipe that was green. And what better inspiration to pull from than Tinker Bell‘s iconic green dress? 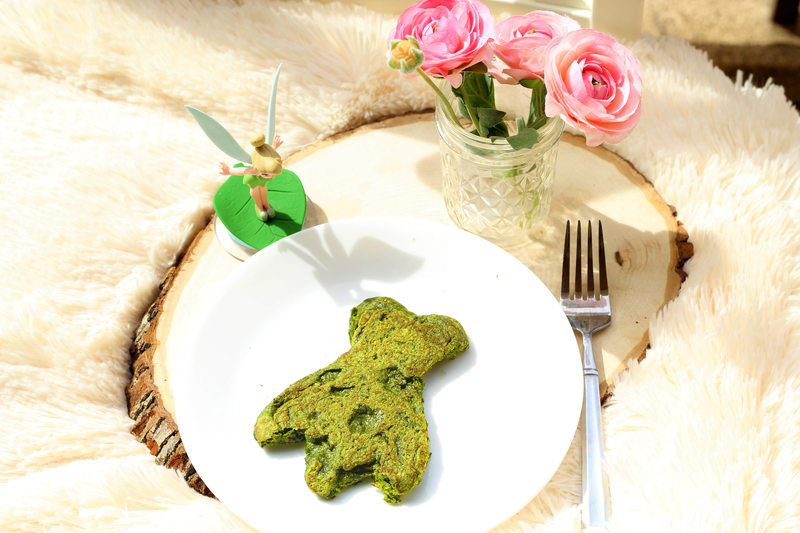 In the first episode of The Healthy Mouse Cooking Show, my friend Colette and I (she notoriously LOVES Tinker Bell, she even had a Pixie Hollow themed bridal shower) make matcha green tea vegan Flitterific Tinker Bell pancakes! Whisk together your syrup, oil, and milk. Add in baking powder, salt, flour, and matcha. Combine. Place batter in a piping bag, cutting off the tip of the bag. Heat coconut oil to melt on a frying pan, coating the bottom entirely. Make sure the stove is on low heat. This will give you time to pipe on your Tinker Bell pancake design without your pancake burning. Use your piping bag to pipe the batter in the shape of Tinker Bell’s dress. Fill in the dress outline with your batter, smoothing the middle with a spoon. Once one side is cooked, flip over to lightly cook the other side. I’m Going on a Disney Cruise with Disney Social Media Moms!